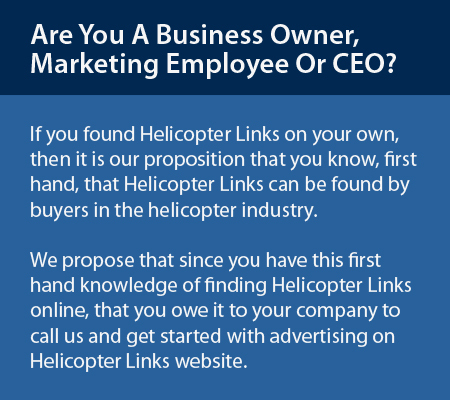 Are You A Business Owner, Marketing Employee, CEO And Found Helicopter Links Website On Your Own? My Case: If You Need Advertising, Don't You Owe It To Your Company To Advertise With Us? 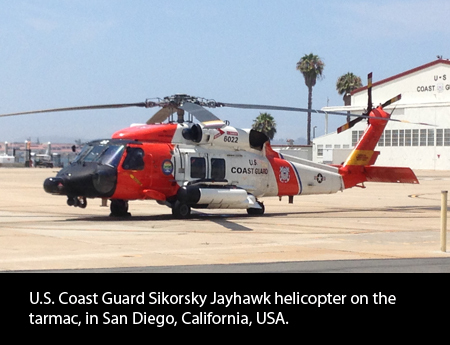 (San Diego, California, USA): Did you find Helicopter Links on your own and was not told about our website? Then please allow me me to make my case as to why it's in your company's best interest, if you need advertising, to advertise on Helicopter Links website. Then don't you owe it to your company to contact us, find out our advertising options and pricing, and if it fits your budget, to advertise us? Why do I say this? Because if you found Helicopter Links and it was useful to you, then there are other people using our website who will find your advertising useful to them. Please allow me to explain: People are visiting Helicopter Links because they have a purpose, to find sellers in the helicopter industry. How do we know this? We know this through Google Analytics (Called by some, the Gold Standard of web statistics.) which shows that about 80% of our visitors find us each year by an internet search, using two (2) or more helicopter related terms. That is, 80% of our visitors are not typing"Helicopter Links" into a search engine but they are still finding and using Helicopter Links website. Or stated another way, 80% of our visitors don't know Helicopter Links website by name but again, out of the millions and millions of website online, people do find Helicopter Links website due to our good Search Engine Optimization (SEO) and then use our website to find sellers in the helicopter industry. This is what makes Helicopter Links unique. People visit our site to find companies in the helicopter industry, due to search engines determining that our website is relevant to the internet user's search. When a company is advertising on Helicopter Links website, you are telling buyers, "Hey, we are open and want your business," which in turn makes your advertising effective because our visitors want to look at your advertising. Helicopter Links is a directory, listing around 3,000 companies in the helicopter industry, by category. People using directories are buyers searching for sellers. The buyer is either ready to buy or researching before buying. Before the internet, when people needed to call a plumber or attorney, they went straight to the yellow pages because they were buyers in search of a seller. Now, most people use the internet. Yes, Google and all other search engines are what? Global yellow page companies. Wouldn't you like to have almost all people seeing your advertising to be buyers in the helicopter industry? That's exactly what Helicopter Links offers you. Why do I ask business owners, marketing personnel, advertising buyers or influencers to call us? Can we be realistic? A small company like Helicopter Links does not have the resources to call thousands of companies in the helicopter industry, each year, to see if they want to advertise with us. In addition, most companies have a very thick and tall wall between sales people calling, and the boss or marketing person. Making it extremely difficult for us to contact the correct person at companies, even if they ARE interested in advertising with Helicopter Links. Which is why it's important that if your company wants to advertise (or would like to find out more about our advertising options) on Helicopter Links website, that we ask you to please call us. If you have never advertised your company, you've never advertised on a directory or for years - you've never added a new company to your advertising mix, it can be a intimidating process because you might be treading in new waters. However, we will discuss with you about what parts of your company that you want to advertise and help you find an affordable way to advertise your company. (We also by the way, research and look at your website to help us understand what your company does, to help make sure we are advertising your company correctly.) Denying your company to advertise due to fear, is not going to help new customers find your company! I have provided some answers (below) which try to address as many questions that people might have about Helicopter Links. Advertising is one of the best ways for new customers (and former customers) to find your company. Our visitors are buyers in the helicopter industry searching for sellers. Either ready to buy or researching before buying. People on Helicopter Links want to look at the advertising. Our visitors are from outside and inside the helicopter industry. Here are some other items about Helicopter Links website and other specific things we offer your company when advertising on Helicopter Links website. You have the option to have Helicopter Links post several sales-only posts each month on Helicopter Links Facebook and Twitter pages. We will also post relevant articles about your company and press releases for your company, throughout the year on Helicopter Links social media pages, which is included in the price of your advertising. Helicopter Links is also a website which can be safely used throughout the day in normally quiet offices. There is no music playing, no videos automatically playing, no non-helicopter or off beat related banner ads and there are no pop-ups asking to join a mailing list or some other such nonsense. I've been in the advertising business for many years and I am very willing to discuss, by phone, advertising, marketing and branding strategies, in general, about your company and also on Helicopter Links website and our social media. Our advertising pricing is affordable on Helicopter Links and lasts for one full year (12 months). We will create a custom advertising quotation for your company, which can be accepted by you or it can be revised. Once you approve of the advertising quotation, we invoice you, make your banner ads and place your advertising on Helicopter Links website for one full year. I hope this article provides you with an overview of Helicopter Links website and the advantages of advertising your company on our website. Please feel free to call me, Mike Hampson, to discuss your advertising needs. Our direct phone is +1 (858) 413-7074 (San Diego, California, USA) or email us at staff@helicopterlinks.com. 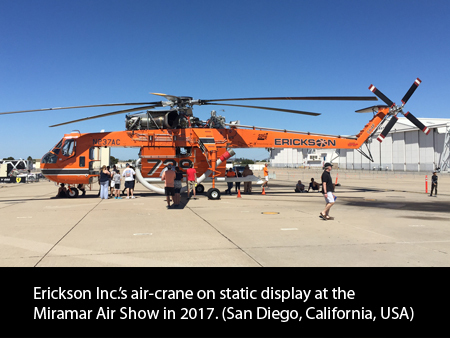 The Erickson Inc.'s air-crane and the Sikorsky Jayhawk photographed by Helicopter Links.